I never wear makeup to the beach, but this time I felt like wearing some mascara. I wasn’t sure which mascara would last because most mascaras run down my face so easily. I own the Maybelline Volum’ Express The Falsies Mascara waterproof and just regular and I really like them. I never wear the waterproof one because I have such a hard time taking it off at night. So I thought, hmm, it should stay on when I go to the water slides then. So I decided to try it out, and I brought makeup remover to put in my locker in case I turned into a raccoon. So the very first slide I went down I ended up getting dunked right under water. 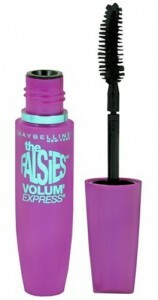 To my surprise the Maybelline The Falsies Volum’ Express Waterproof Mascara held up completely. Actually it lasted the entire day at the waterslides. I was so impressed, it will now be my go to summer mascara. Who knows when you will get tossed into a pool. Make sure you buy the w aterproof one. The lettering on my waterproof one is a turquoise colour. You can buy the Maybelline Falsies Mascara at any drugstore, it’s only about $5.99 in Canada, a very good deal.